Hand-sewn potholders and a new hat! Thank you so much, Yahaira! They are large and thick and extremely functional. 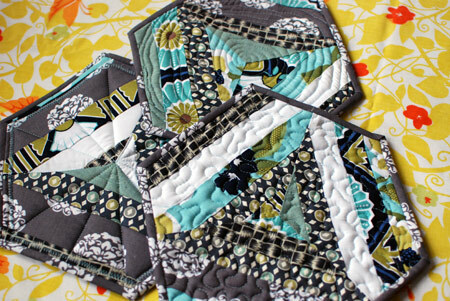 The matching fabric coasters are already being used! 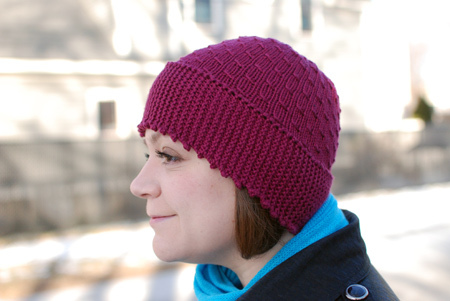 Pattern: Picot Edge Hat by So Much Yarn, So Little Time! Carolyn. Free pattern on Ravelry. Yarn: Ella Rae Bamboo Silk, 70% bamboo viscose, 30% silk. I used 1.5 skeins of #22 wine colorway. This is a wonderful yarn, extremely soft, silky, and drapey (still on sale at WEBS where I got it). I was afraid that the fabric would stretch a lot when wet, so I did not block this hat. Needles: I didn’t note the size I used, unfortunately, though I think it was a US 6. I know I modified the pattern to be worked over fewer stitches (90 instead of 114) because my yarn is heavier. 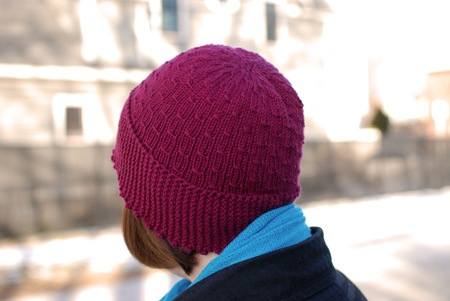 The numbers were really easy to figure out because the garter stitch brim is knit first, which you can make as long or as short as you want. Then the stitches for the rest of the hat are picked up (make a few increases if necessary so they’re a multiple of 6). This is my new favorite hat to wear in the 35-45F temperature range! I made the hat nice and long so it covers my ears and neck, and the non-wooly fabric keeps me itch free. It’s a little too late, but I think this would also be a wonderful last-minute Holiday gift because the hat literally took me two evenings, start to finish. Lovely hat. So much more attractive than the helmet hats I see everyone wearing on the train! Fantastic potholders! That Yahaira is a love for sure. Love this hat, too. Completely perfect for the weather right now. Fabulous! I love it on you! I was just thinking of knitting myself another…with the flower on the brim as many have done. I love the potholders. They are beautiful and the hat is lovely. I have it queued on Ravelry and thanks for the great photos. This is only the second time I’ve seen the name Yahaira. That’s my grandson’s SO’s name and she is lovely. They just had a baby girl. Really love this hat – thanks for sharing! I love the hat. I got a skein of the Ella Rae Bamboo Silk for a gift and wish it was 2. Its so soft. Cute hat! You are my go-to girl for non-wooly. Speaking of which, I have some new cheap, but comfy and warm snow boots for the occasional Carolina snow, like we had for Christmas. They are a little on the roomy side, so I thought I’d knit myself some chunkier socks (I was wearing your Grumperina yarn, by the way). Do you have a yarn rec? I don’t like itchy, but I can stand a little wool on my feet. Thanks! How does the bamboo hold up in the yarn? I ask because I’ve used bamboo jersey fabric for sewing and I swear the bamboo just makes everything droop after a while. 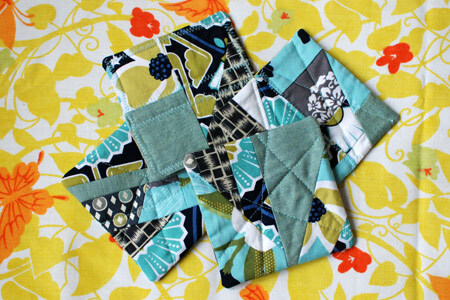 Even so, it’s in my fabric iPhone because it is environmentally friendly fiber….